In 2010 I stood under the Matterhorn, staring it’s perfect looking profile. Dreaming, that some day I might have a chance to climb it. I didn’t even imagined climbing the north face. It was my first trip to the Alps. In October 2015 circle closed. 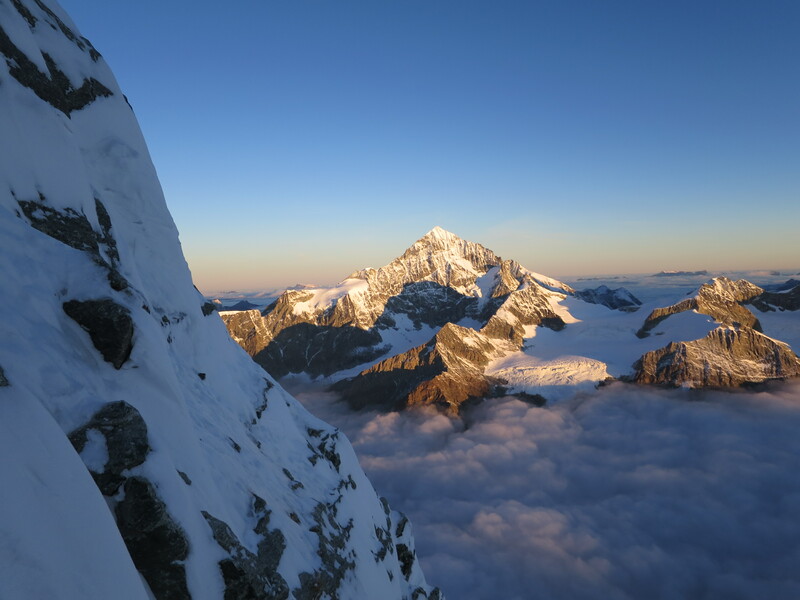 On the summit of the Matterhorn with no wind, Valais Alps spreading as far as eye can see. We had just climbed the mythical north face. No other teams on the mountain. 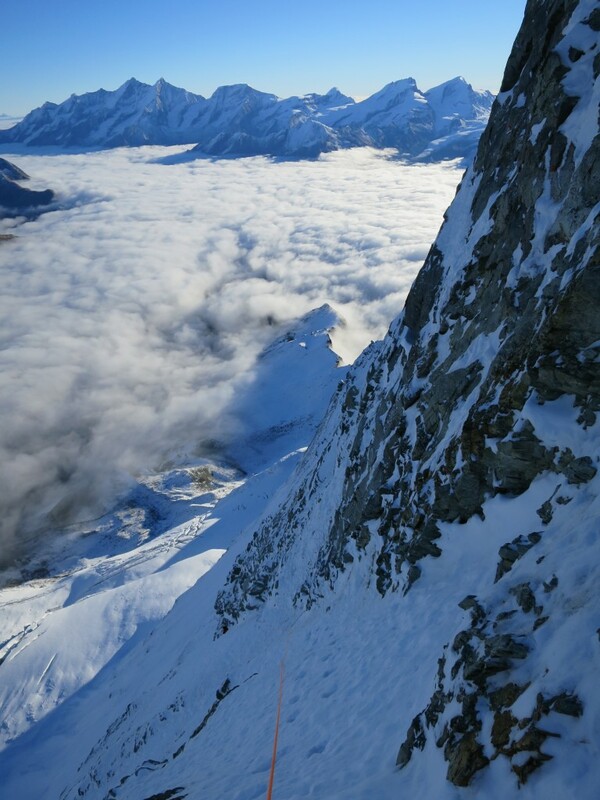 It was one of those golden moments of alpinism. Line of the Schmidt with our belays and wrong-turn marked. Two days earlier we sat in the Leschaux refuge eyeing the dry´ish N face of the Jorasses. Lack of ice on the Croz forced us to figure out plan B. And that was the Matterhorn. It had looked good in the webcam. Luckily the next day was still rainy and we had just enough time drive to Zermatt, and catch a last lift up to Schwarzsee. A pleasant two hour hike to the Hörnli hut`s brand new winter room crowned the busy day. Snowy Matterhorn seen from the approach. 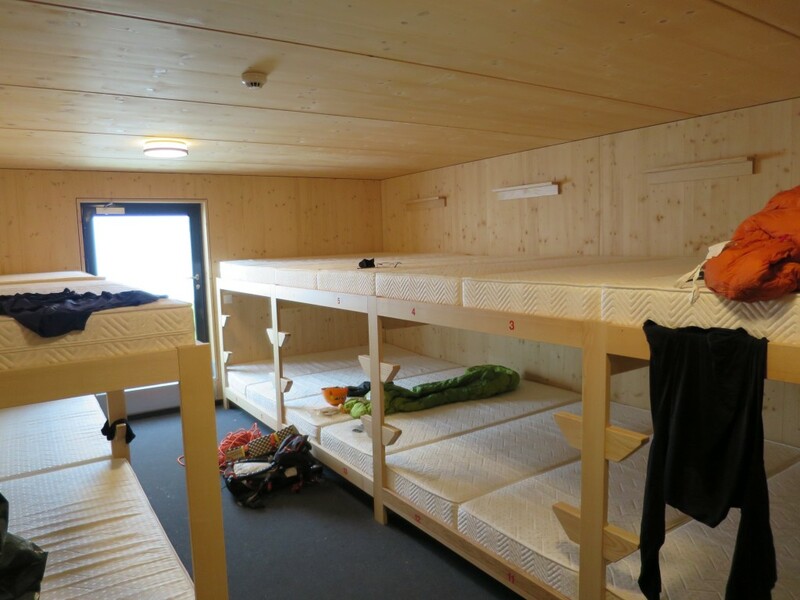 A brand new winter room in the Hörnli hut! Approach to the route from the Hörnli was a quick walk. Some deep snow with one steeper section, which we soloed, brought us under the schrund. There were no tracks, we knew that route finding’s going to be difficult in the dark. First 400 meters of 50-55° snow should go quickly, but we climbed far too left. I ended up balancing really delicate M6 bulge before noticing our mistake. Huge traverse rightwards and lost 2 hours in time later we reached the mixed section leading to the Ramp. Sugar snow seemed to be a theme of the day. Easy to climb, but impossible to protect. We belayed two easy neve pitches until joining the Ramp. Kalle belaying the first of the two pitches leading to the Ramp. Kalle following as we simul-climb the Ramp. Mischabelgrat in the horizon. 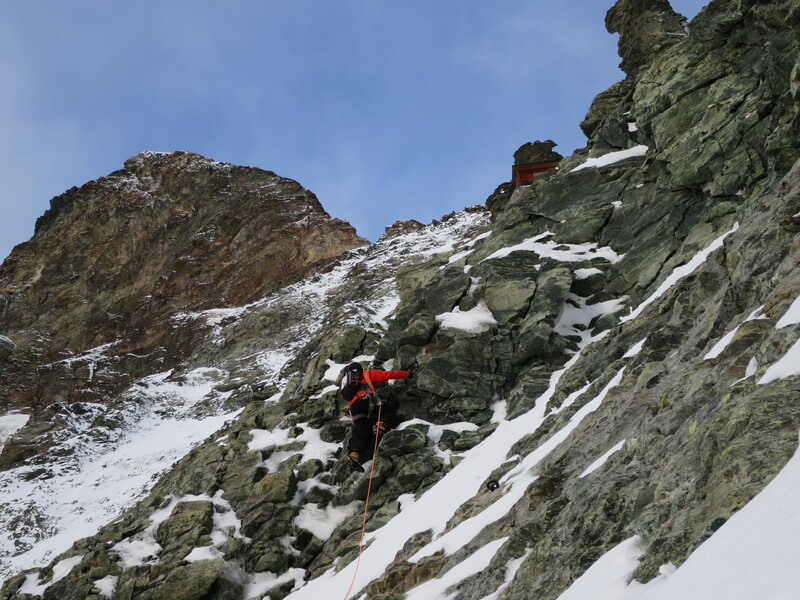 Middle section of the route is more interesting – steeper ice and more delicate traversing. Due to poor quality of ice and rock, terrain was again mostly unprotectable. And that’s where the grade comes I believe. You have to be able to climb moderate terrain without thinking too much. We pitched only three times overall. We had a really detailed topo, but the end of the Ramp was confusing. Just make a right trending traverse and you are able to see the icefall, which leads you to the summit snowfields. Do not follow the obvious looking couloir on the left! Kalle climbing the last meters of the icefall. Summit slopes were endless. It felt so good to reach the Zmutt ridge and the sun. 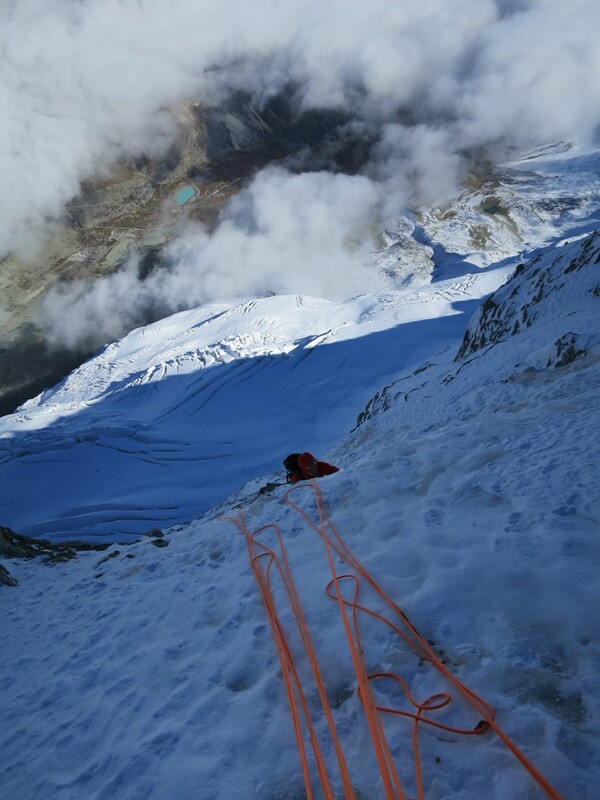 We shortened the rope and scrambled slowly the last meters to the Italian summit. 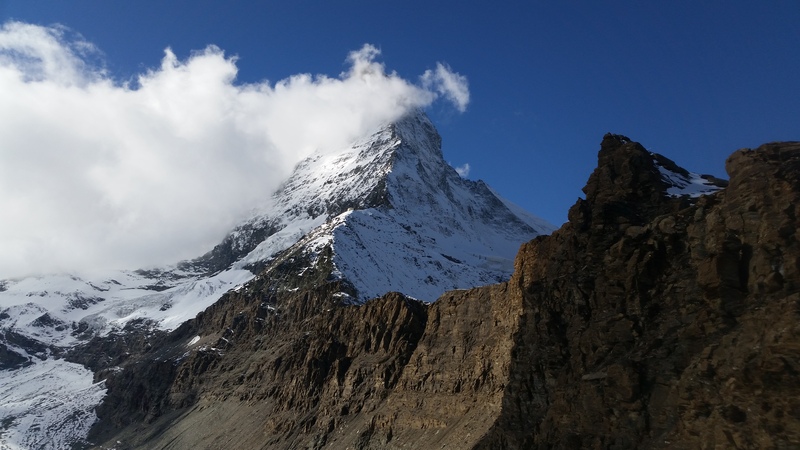 Matterhorn was celebrating 150 year anniversary of first ascent and I couldn´t imagine better year to climb this iconic peak. We were slightly suprised that the Schmidt route went down that easily. 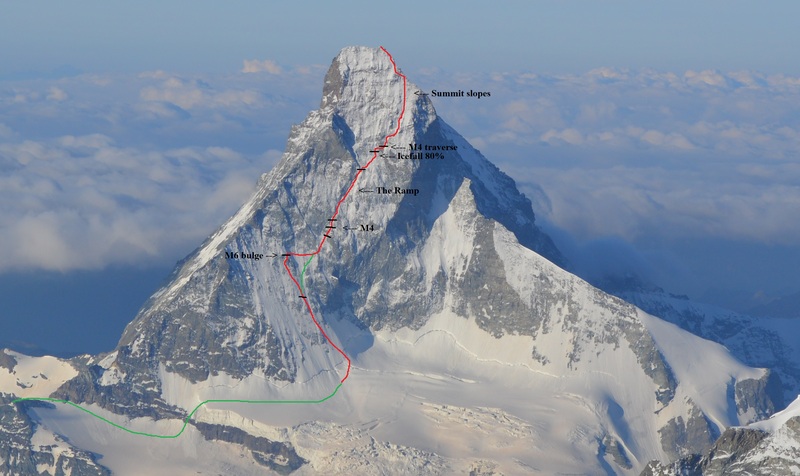 It´s a long route for sure, but technical difficulties are quite low in good conditions. 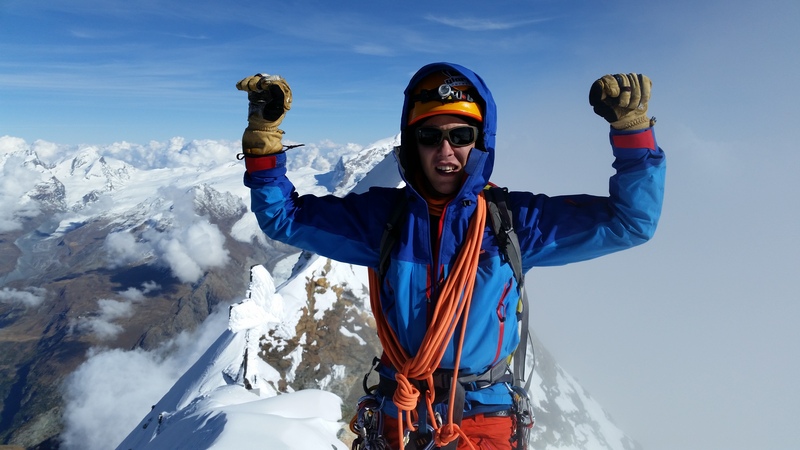 Juho on the Matterhorn`s Italian side summit. We still had the snowy Hörnli to climb down. Fixed ropes were covered in ice and tiresome sugar snow made the going delicate. The crux of the day obviously. We arrived to the Solvay hut (4000m) at 6pm and decided to spend cold, but safe night in the hut. The following day we continued down to Zermatt in a sunshine. 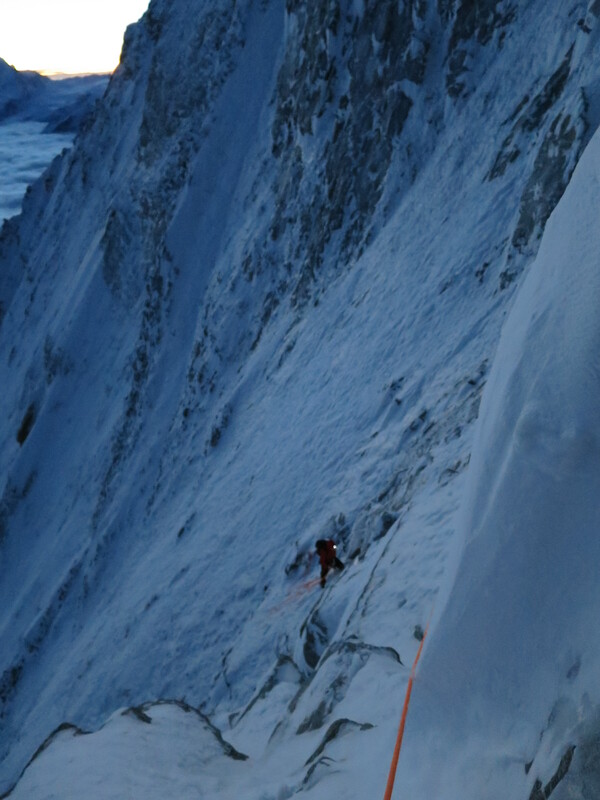 Kalle down climbing the never ending Hörnli ridge. The best topo I´ve seen anywhere is Kletterblog`s.